It seems odd that this Mass, perhaps the most untypical and undatable of Obrecht�s approximately thirty published masses should be one of the best known and often performed. It is in many ways a tough nut to crack for performers and listeners but not as tough as the amazing compositional tour-de-force which the composer set himself. I can recall a recording in the late 1960s on Archiv by Konrad Ruhland (I�m afraid I cannot recall any other details) which was coupled with the completely contrasting �Missa Mi-Mi� of Ockeghem. The Obrecht was a shock in that it was the first time that I had come across a mass with the plainchant unchanged in the top part (Descantus 1) throughout and which sang, not the Mass text, but the motet text. Secondly this version had curious instrumental doubling of the top part making it ring out in a powerful but expressionless manner. Oddly enough I have just read a review in the November 2003 �Gramophone� of a new recording of this Mass (which I have not yet heard) by Ars Nova under Paul Hillier (Van CDO2), coupled with several of Obrecht�s� Marian motets. So, after thirty years, two versions appear almost simultaneously. The Clerks group has already made a tremendous impression in this repertoire with the complete works of Ockeghem, much Josquin and discs of Barbereau and Pierre de la Rue as well as an earlier Obrecht. Sometimes their tempi and general flavour can be a little rushed and lacking in subtlety. More importantly in this disc the acoustic of the church of St. Andrew�s, West Wratting, comes across as having little resonance and atmosphere. Disappointingly, this makes these recordings more studio sounding than is appropriate. To give some idea of the music�s compositional background I think Rob Wegman in his �Born for the Muses� (Clarendon Press OUP 1994) is quite right when he says that in this Mass Obrecht "was Architect first, musician second". I will quote further from his book. "The Mass consists of 888 semibreves, the Kyrie and Gloria have 333 the rest come to 555". The form is: Kyrie in three parts, Gloria in four, Credo (which also includes the plainchant �Audi nos� in Descantus II) in five and Sanctus in six parts now including the plainchant �Mediatrix nostra�. The seven-part Agnus 1 and 2 include the chant �Celsus nuntiat Gabriel� and culminate in "the Agnus 3 which now has four pre-existent chant melodies, one being the �Sub Tuum� of course still in the top, whilst the other three parts freely rhythmize". Why these particular plainchant texts? They are all Marian-related, and a look at the CD cover will explain, as the writer of the notes Edward Wickham points out, that the Virgin is shown massively towering above the heads of the ordinary mortals below with out-folded wings over the top of them. This is the function then of the �Sub Tuum� plainchant: always above the other voices which gradually, with the use of additional texts, enunciate even more praise in her honour. Does all this make a worthwhile piece of music? Well I have to say that I�m not sure. This is not my favourite Obrecht Mass. I prefer him when he is really free and fantasises around melodies as in the wonderful and huge �Missa Maria Zart�. (Tallis Scholars on Gimell 0132). Yet this is no reflection on the performers who carry all before them and seem convinced by the music�s quality. One may wonder why Obrecht does not find himself performed in anything other than concerts or on disc, whereas Josquin and to a lesser extent some works of Ockeghem have found their way into the liturgy. Part of the problem is his very complex counterpoint. Another problem might be his chosen texts. The CD closes with �Factor Orbis� a fine but complex work which exemplifies these problems. 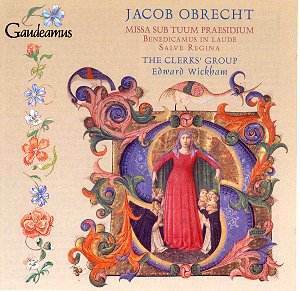 Edward Wickham describes it as "a joyful and sometimes meditative musical collage of Advent Chants and texts, matched only in sophistication by Obrecht�s Mass". He goes on "repeated listening will reveal an intricate web of textual polyphony". There is little chance of a modern choir singing such music other than a specialist one. The same surely applies to the mellifluous �Salve Regina�. Two settings recorded by Jeremy Summerly on Naxos (8.553210) with the Oxford Camerata, are at least in four and six parts respectively. However this lengthy version is in just three and tuning is difficult in many places; superbly managed here, of course. �Mille Quingentis� probably commemorates the death of Obrecht�s father but also quotes Josquin�s famous �Ave Maria�. This music is most unlikely to come your way again. The �Salve crux� has been recorded before but at a much slower tempo and at an even lower pitch. (The Dufay Consort/Gary Cooper Dervoguilla CD102). It is a motet for the �Finding of the Cross�, hardly a subject for modern liturgies although some Roman Catholic establishments might well like to look at it. Being for men�s voices and over ten minutes in length it is unlikely to appeal. The Clerks� Group is at present the best companion in this repertoire. That said, I never feel totally convinced by them; I would like more flamboyance and passion in the performances which are often rather chaste. I would suggest anyway that this disc would not be the best place to start with this composer. Try instead the Clerks� Group recording of the �Missa Malheur me Bat� (ASV GAU 171) which includes motets by the little known Johannes Martini. For all that, it is a wonderful thing that here we have a totally professional and committed group who have more or less consistently the same personnel from disc to disc and who are giving us beautiful and thoughtful renderings of music which otherwise would remain on dusty shelves.